Congressman Lee Zeldin announced Sunday that he expects his Plum Island bill to leave committee April 28. The effort to preserve Plum Island could get a shot in the arm this Thursday, April 28, when Congressman Lee Zeldin says he expects a bill he introduced to halt the sale of the island to be marked up and voted out of committee for a vote on the floor of the U.S. House of Representatives. The 2008 legislation authorizing the closure of the lab and the construction of a new lab in Manhattan, Kansas, had required the Department of Homeland Security, which manages the island, to prepare it for a public auction. 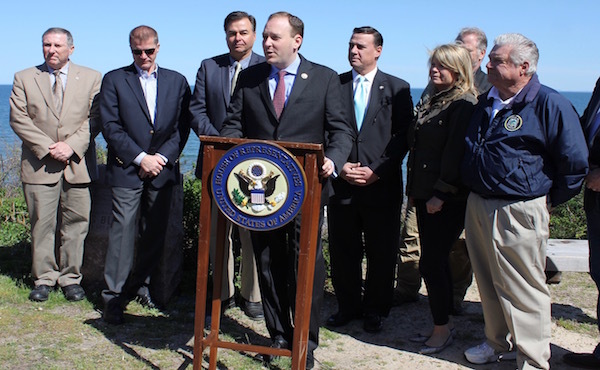 Mr. Zeldin, who held a press conference at Riverhead’s Reeves Park Beach Sunday morning to announce the anticipated vote, said he expects Senator Richard Blumenthal of Connecticut to introduce a mirror bill in the senate once the house bill is released from committee. Mr. Zeldin said he hopes the bill makes it to President Barack Obama’s desk for signature before the president leaves office at the end of this year. The legislation to be voted on by the committee April 28 is an “amendment in the form of a substitute,” replacing the entire text of Mr. Zeldin’s original bill, to be introduced by Homeland Security Committee member Dan Donovan, a congressman from Staten Island. 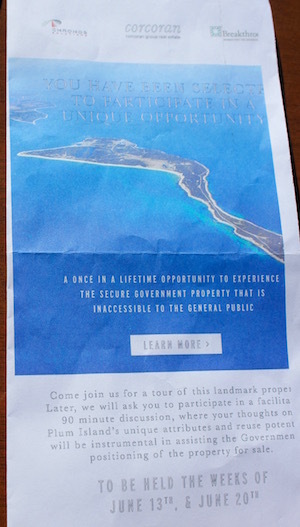 An email advertising a tour of Plum Island for prospective buyers. Mr. Zeldin said the new bill directs the General Accounting Office to perform a detailed study of the future options for Plum Island if the coalition of agencies and citizen groups working to preserve the island aren’t happy with a Department of Homeland Security study currently underway. All attempts to sell the island would be halted during the studies, and for 180 days after the GAO study is sent to Congress. Mr. Turner said he looks forward to Plum Island being off the auction block by next Earth Day. Chris Cryder of Save the Sound said his group’s message, and that of the more than 60 other agencies in the Preserve Plum Island Coalition, is simple. “We want to see the rest of the island preserved, not bulldozed and sold as a golf course,” he said, adding that the groups would also like to see the research laboratory kept in use. Scott Russell credits Al Krupski for the decision to zone Plum Island. 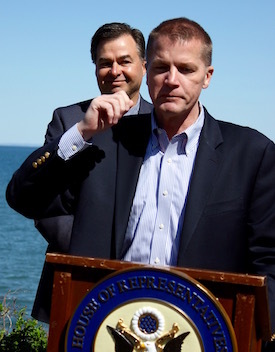 Southold Town’s decision three years ago to zone Plum Island — which had been in federal hands since before zoning was enacted in Southold — helped lay the groundwork to squash development efforts. The island can now only be used for a research institution and a wildlife preserve. Southold Town Supervisor Scott Russell credited the idea to County Legislator Al Krupski, who was a Southold Town Councilman at the time. “Al Krupski said ‘we’ve gotta do something,” and I said ‘who would be crazy enough to buy Plum Island,” said Scott Russell. “Then we got the call from Donald Trump’s representative, who wanted to put a golf course there. Mr. Zeldin said he knows of only one developer, Mr. Trump, who expressed interest in purchasing the island.